J.L. Bourne is on active duty as a commissioned U.S. naval officer. Born in a small town in rural Arkansas, he now resides in Washington, D.C. Visit him at J.L.Bourne’s website. Click here for more stories by J.L. Bourne. Day by Day Armageddon — (2004-2016) Publisher: Start intercept: Sporadic reports indicate chaos and violence spreading through U.S. cities. An unknown evil is sweeping the planet. The dead are rising to claim the Earth as the new dominant species in the food chain. Intercept complete. In your hands is the handwritten journal depicting one man’s struggle for survival. Trapped in the midst of global disaster, he must make decisions; choices that ultimately mean life, or the eternal curse to walk as one of them. Enter, if you will, into the world of the undead. 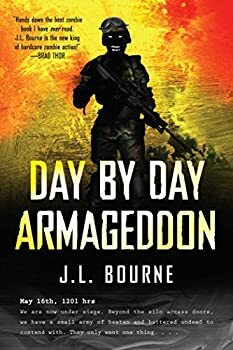 Day by Day Armageddon is a fictional journal of an unnamed Navy pilot depicting the daily events of the zombie apocalypse. The journal begins with a new year’s resolution, describes newscasts about a virus outbreak in china, then continues to describe each day as things around the world get progressively worse, leading to the eventual total collapse of modern society. J.L. Bourne has not brought anything new to the table as far as zombie lore goes. He sticks to the fundamentals laid out by George A. Romero’s films. These zombies are slow, stupid, and they bite. They also moan and shuffle around. Many zombie fans see this as a purist’s approach to zombie fiction; I see it as unoriginal. Welcome back to the zombie apocalypse! Your personal guide in this rotten wasteland is the still unnamed naval officer from Day by Day Armageddon. J.L. 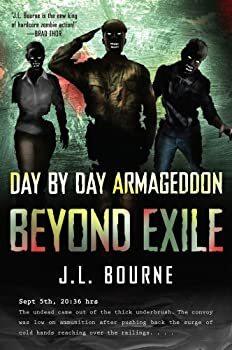 Bourne’s Beyond Exile starts immediately following the journal entry at the end of the first book with the narrator and his companions residing in a relatively secure location. Life has begun to feel somewhat normal. However, normalcy quickly deteriorates, and the places that were once safe are now death traps. With bravery, luck, and a little ingenuity they may just find a way to be safe again.